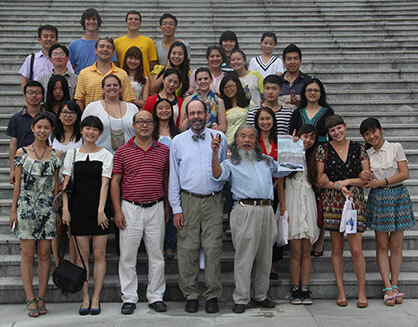 LSU and SAU students spent two weeks collaborating on a landscape architecture project for Sichuan Province, China. LSU is consistently recognized as one of the most affordable, highest value colleges in the U.S. Even so, six years of out-of-state tuition can be a substantial investment. Landscape architecture student Kevin McKee, from Houston, said that receiving the Marguerite Conrad Memorial Scholarship allowed him to travel with six other students in Professor Bruce Sharky’s studio class on a two-week trip to Sichuan Province, China. The class traveled to Ya’an, a city that, like most of China, is being heavily influenced by urbanization. As part of a new cooperative agreement, they met with students from Sichuan Agricultural University to collaborate on a semester-long landscape design project. The students worked in teams to find ways to maintain and preserve farmland in the midst of urbanization, and increase efficiency and production in Ya’an. Throughout the fall semester, the two classes maintained communication through email and presented designs to each other via Skype. donors have continued contributions to the scholarship, enabling more students to expand their education through travel abroad.